Note: Edited to add direct links below. 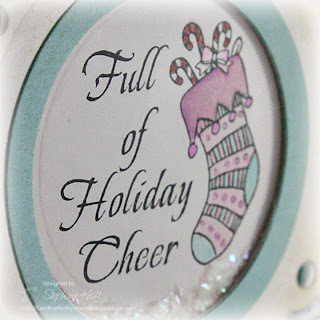 Welcome to JustRite Stampers’ newest Wednesday feature, 12 Weeks of Christmas Blog Hops #3! Every Wednesday up until Thanksgiving some of your favorite designers will be joining some of the JustRite design team for a series of Christmas blog hops, showcasing JustRite’s entire Christmas Collection of stamps! So mark your calendars for Wednesdays at 9am Central for great Christmas gift, card &amp; project ideas, starting at the JustRite Inspiration blog! Today I was in the mood to use some non-traditional Christmas colors. I pulled out a few papers from Cosmo Cricket Mitten Weather and let the aquas and purples inspire my creation. I used JB-08765 Old Fashioned Christmas and made a shaker out of the center. I started to use Karen's Sweet Sunday Sketch #86, but I ended up leaving off a couple of panels before I was finished. Please visit these designers’ blogs to see what fabulous Christmas projects they have for you on the hop today! Such a sweet card, Stephanie -- love these colors you used! Beautiful! Thanks so much for sharing everyone! What a great hop! Love your card. Adore the background papers and how you have almost created a patchwork pattern. Great shaker card. Love the colors. Very pretty pastel colors. I love how you tied it all together with the colors and the sewing. ACK!!! Love the colors Steph - the layout - the image - just wonderful. I also think I have to have that eyelet nestie - do you use it a lot? Love the colors...just love everything. HI Stephanie, your card is so beautiful, I just love the fresh bright colours and the stamping is perfect! TFS, have a great week! What a sweet card Stephanie! Such a pretty color combo! Love the addition of sparkle & dimension! Another winning color combo that's non-traditional & OH SO PRETTY!!! Pretty card. Colors are gorgeous. Love the colors, soft and pretty. The layout/design is great. This is my favorite one!!! There's always something magical about shaker boxes. I think the child in me always wants to shake them up. Love the colors you paired up with this very sweet card!! This is SO gorgeous Steph! LOVE how you made it a shaker!! Just lovely! The soft colors are so pretty. I have to get some JR Christmas stamps. Stephanie this is fabulous!! Love the colours and colouring!! They way you used this sketch is awesome and love the way you framed the image!!! Such a lovely card! I love that purple ribbon. The embossing gives it a nice texture and layering! I love the embossing across the card and that stamp is lovely. Beautiful card Stephanie!! I love the soft pretty colors you used!! Love the soft colors. They are beautiful for a holiday card. Lovely card! A beautiful card Stephanie. I love the colors you chose.